There are times when Windows doesn’t want to format a USB drive. You might get an error saying the drive is write-protected, or you’ll get an error saying it just can’t format it. Sometimes you’ll be able to see the drive but the size available for you to format is incorrect. You have a few options you can try to regain full access to your USB drive. There are some free third party tools you can download and install, but you should be able to do it using the tools built into Windows. 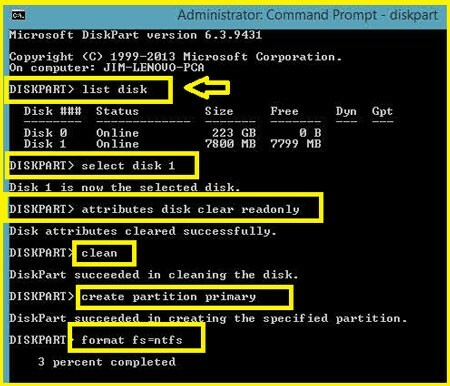 The first step requires a command prompt opened as Administrator. Then you’ll run these commands similar to the screenshot above. DISCLAIMER: Double check the drive you select! Selecting the wrong one could format your computer. Type clean (you may need to repeat twice). If it doesn’t work, don’t proceed with the next instruction. Depending on the size of the USB drive, the last step could take a while. You could add the quick flag to the end of the command to speed things up.